I have some thoughts on how Pvt. Chelsea Manning’s gender dysphoria was rolled out. Let me begin by saying I’m going to give, and I’m going to advocate for, respect for Manning’s chosen name and publicly embraced gender, and I’m going to use female pronouns and call her Chelsea. That; however, comes with a mixed bag of emotions. I’m going to respect Chelsea’s public request in part because of the Biblical teaching I learned as Pentecostal youth that I still embrace today: treat others as I want to be treated. But as I respect her name and identified gender, I’m cognizant that Chelsea didn’t respect the trans community — the trans community of which I am a part — in how she came out. I don’t know off the top of my head what the Army’s core values are. I suppose I could look those up, but the Army’s core values are not how I’m thinking about Chelsea Manning’s public life as her one public day as a trans woman and as a part of my military family. The core values I learned as a US Navy sailor — the ones I’m filtering her public behavior through — are honor, courage, and commitment. One could make the argument that Chelsea Manning showed courage in releasing documents that opened up government. We Americans learned some a lot about the drone program that’s being done in the American people’s name that should have been made public by the Obama Administration. But that said, she didn’t have sufficient time to route through all of the 700,000 documents she released via Wikileaks. First, your honor I want to start off with an apology. I am sorry that my actions hurt people. I’m sorry that I hurt the United States. At the time of my decisions, as you know, I was dealing with a lot of issues, issues that are ongoing and continuing to effect me. Although a considerable difficulty in my life, these issues are not an excuse for my actions. I understood what I was doing, and decisions I made. However I did not fully appreciate the broader effects of my actions. 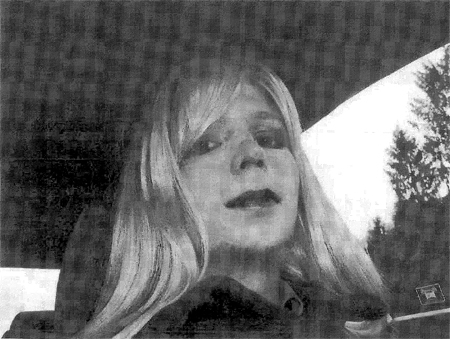 In a manner similar to how Chelsea didn’t consider the broader effects of her actions in her release of classified information, there seems to me to be a parallel lack of consideration for the broader effects of her actions to the trans subcommunity of the LGBT community in how she came out…a parallel lack of respect for others whose lives she didn’t consider. As I read Chelsea’s announcement, I was struck that the thrust of her statement was about her wants and needs, and that there was no mention or consideration of the impact of her statement on other trans people. For example, Chelsea mad her announcement without warning to LGB and especially T community leaders even as she put LGBT community leaders the in the position of defending her gender identity. What she did was put the responsibility of defending her chosen name and preferred pronouns on LGBT non-profits and trans community activists who weren’t fully aware of if, when, or how she was going to publicly announce she has a female gender identity. To me, it’s notable that Chelsea made her announcement that she was a woman without publicly using the terms trans, trans*, transgender, or transsexual to describe herself, or acknowledge she was part of a community that were going to be defending her gender identity. The timing of her announcement has the feel to me as the B.Scott and the Kristen Beck announcements. The timing was, or felt to many in trans community, to be self-serving. All three of their announcements addressed their needs, but not how these announcements would affect their trans community peers. I feel that two of these folk (B. Scott and Chelsea Manning) came out in a way that helped their legal situations, but then brought to trans community members’ gender identities, gender expressions, and transitions into question to broader society, as well as subjecting trans identities to ridicule. There is no honor in harming the community to which you are entering. And, there is no honor is announcing the new name Chelsea wishes to be addressed by and her gender identity without considering how the timing of her announcement may impact efforts for open military service for trans people in the service. I don’t know about anyone else, but I see a pattern of behavior where she doesn’t consider the consequences of her actions…to include the impact her behavior has had and is having on others. Very specifically regarding her trans siblings serving in silence in the military services, Chelsea is harming the effort towards open military service by trans servicemembers. She is doing this by being a poster child for the meme that trans people are pathological and can’t appropriately serve in the military services with honor and distinction. And, of course, there is the courage and commitment thing. Prior to being arrested, she reached out for help to her immediate supervisor, essentially outing herself as trans with the “My Problem” email and inclusion of a photo of her presenting as female. Courage and commitment to further identify as trans to the Army with intent to receive treatment for her gender dysphoria and a discharge could have included going to the next and the next and the next supervisor in her chain of command, or could have included contacting a military psychologist or psychiatrist — contacting anyone with the power to help her until someone in the Army acted or what she described as her problem. (I do believe there was a failure of leadership by her immediate supervisor for not passing on the information up the chain of command when it was a clear call for help, but that’s another issue.) It seems to me that she demonstrated a lack of courage and commitment in how she reached out for help…from the military and discharged from to be treated and discharged by the Army for what was then referred to under DSM-IV TR as gender identity disorder. Could Chelsea have changed her name to Breanna or Chelsea while she was in service? Others I know in the service have changed their names on their way out of the service — it would have been another way to demonstrate commitment to addressing her gender dysphoria. Not knowing her deployment schedule; however, I’m not sure that option was available to her between her deployment schedule and when she figured out she had a female gender identity, but if she had changed her legal name to Breanna or Chelsea though, it would have been a sign of courage and commitment to being female when she first knew she was female back in 2010. I will respect Chelsea’s desire to be called Chelsea and be referred to by female pronouns — this is per the Associated Press Styleguide and the GLAAD Media Reference Guide. I will slam journalists hard who don’t conform to those standards, and behind the scenes with some I already have.. But if any think I appreciate the manner in which Chelsea came out in acting with a sense of entitlement regarding her change of name and public gender, in addressing her own wants and needs in her coming out while showing disrespect for trans community that is now in the position of defending her, and in the harm to trans servicemembers who are right now honorably serving in silence by making trans service look completely incompatible with military service, that would be incorrect. I don’t see respect, honor, courage, and commitment in her behavior to date. I see a pattern of behavior where she doesn’t consider the consequences of her actions…the impact that her behavior has on others. I will forcefully respect her public desire to be called Chelsea and her public desire to be referred to with female pronouns. I will defend her in that to my last breath, were that required. But, that’s pretty much only because I treat others the way I want others to my trans peers and treat me…because I go to bat for my peers in trans community in the same way I want others to go to bat for my trans peers and me. It’s not at all because I have great respect at this point in time for Chelsea herself. Basically I’m standing behind trans community as a whole rather than standing behind Chelsea as an individual. Chelsea, as a sibling in both military and trans community, hasn’t earned my respect.